Langley, U.K., Tokyo, Japan -- Japan Airlines Co., Ltd., (TSE: 9201) (“JAL”) and Travelport Worldwide (NYSE: TVPT) (“Travelport”), a leading travel technology company, agreed to form a joint venture to take ownership of Travelport Japan K.K. 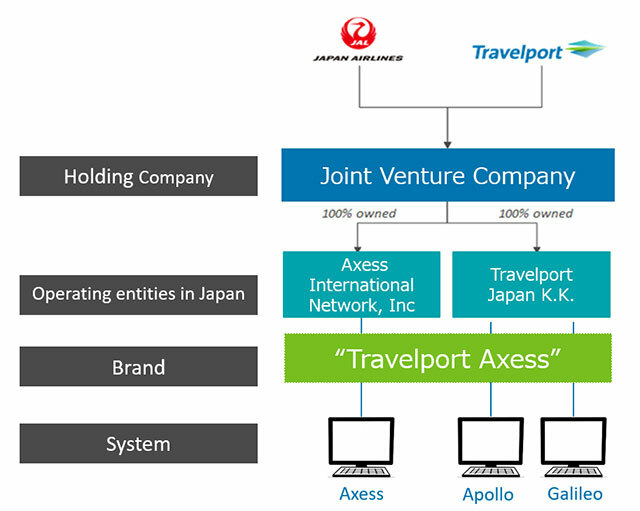 (“Travelport Japan”) and JAL’s 100% owned subsidiary, Axess International Network, Inc. (“Axess”). Under the unified Travelport Axess brand, the joint venture will operate a Global Distribution System (GDS) tailored to the needs of the Japanese travel industry. Travelport has worked closely with and provided core systems to Axess under technical collaboration arrangements since 2012 and has established a trusted relationship with JAL. JAL is pleased to partner with Travelport in this joint venture due to Travelport’s focus on meeting the needs of its travel agency customers, demonstrating JAL’s strong commitment to continue to work closely with Japan’s travel agents. For Travelport, this joint venture will strengthen its position in Japan’s growing international travel industry. Travelport Axess will benefit from a team of Japan-based service agents and product specialists uniquely able to deliver products tailored to customer needs. Through combining the strengths of the two companies, Travelport Axess aims to build a strong position and plans to become the leading GDS provider in Japan. Under the planned agreement, Travelport will hold a majority stake in Travelport Axess, with JAL controlling the remaining stake and playing an active role in the joint venture. Following the signing of a definitive agreement between Travelport and JAL, the new joint venture is expected to be formed on 1 st June 2019. Initially, Travelport Japan and Axess will continue to operate independently, with a gradual program of integration to combine the two organizations commencing later this year. The number of international travelers to Japan topped the 30-million mark for the first time in 2018, a threefold increase over the past 5 years, according to the Japan National Tourism Agency (JNTO) while departures by Japanese outbound travelers totaled nearly 19 million in 2018, the fourth year of growth, according to Japan Travel Bureau (JTB).